Getting to the Frankfurt am Main exhibition show grounds (Messe) is easy and cheap by public transportation (train, tram, bus) or car from the Hauptbahnhof and Airport. Public transportation is the easiest way to reach the large exhibition halls, conference center, and show halls of the Messe (trade fairgrounds) in Frankfurt. S and U-Bahn trains provide the cheapest and fastest transportation from the Frankfurt Hauptbahnhof (main station) and International Airport (FRA) but buses and trams are also available. Taxis are convenient and arriving by private car is also a sensible options as special parking facilities are available near the Messe during major consumer shows. During major exhibitions, hotel prices in Frankfurt am Main are very expensive but public transportation is always relatively cheap and often free for Messe visitors. My Driver gives online quotations for private airport transfers without first requiring personal details or flight numbers. The extensive trade fair show grounds in Frankfurt am Main (Frankfurter Messegelände) are in the western suburbs of the city close to important transportation infrastructure. From the Hauptbahnhof (main station) and down town areas, it takes only minutes to drive to the Messe and driving time from Frankfurt International Airport (FRA) can be as fast as ten minutes. When driving to the Frankfurt Messe, the best way to arrive by car is on the Autobahn A648 which enters Frankfurt directly next to the trade fair grounds. Cars without a green sticker for travel in a Low-Emission Zone may use this route to reach the Messe Parkhaus Rebstock parking garage and Tor Nord entrance – driving further into Frankfurt and the rest of the show grounds without a green sticker may result in a fine. Drivers on the Autobahn A5, should use the Westkreuz Frankfurt (junction 19) to get onto the A648 a few kilometers from the show grounds. From Frankfurt International Airport (FRA), take the A3 towards Frankfurt and turn north onto the A5 at the Frankfurter Kreuz junction. Drivers should follow the clear signposting “Messe” – road layout and traffic directions are altered for some major consumer shows. For major fairs such as the bi-annual Frankfurt International Automobile Show (IAA), up to 10,000 parking spots are available with free shuttle buses taking visitors from the more remote parking lots to the fair grounds. Public transportation is generally the best option when traveling to the Frankfurt show grounds – the transportation fare is often included in the price of a Messe show ticket. S and U-Bahn trains, buses, and trams stop directly at the fairgrounds. The fare is the same irrespective of the mode of public transportation used in Frankfurt. S-Bahn trains S3, S4, S5, and S6 all stop at the Frankfurt “Messe” station, which is the second stop from the Hauptbahnhof (main train station). Traveling time is only 4 minutes with trains so frequent that there is no need to consult timetables in advance. The S-Bahn “Messe” station is in the center of the show grounds at the Torhaus entrance. Transportation from Frankfurt International Airport (FRA) to the Frankfurter Messegelände is easy and fast. Taxis and shuttle services take as little as 10 minutes while trains are only marginally slower but cheaper. 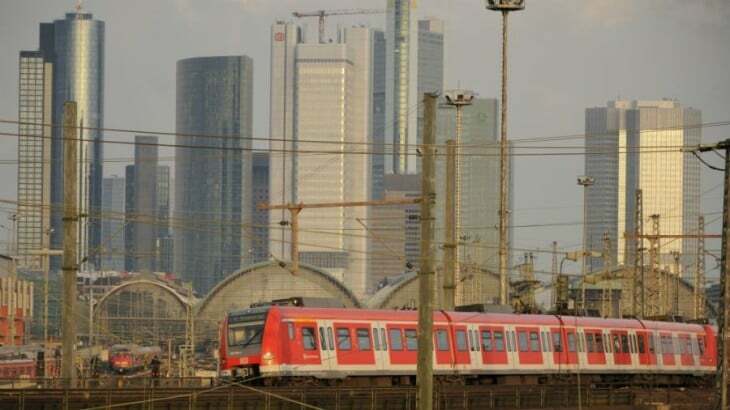 S-Bahn trains S8 and S9 connect Frankfurt International Airport (FRA) and the Hauptbahnhof (main station) several times per hour in just over 10 minutes. From the Hauptbahnhof, S-Bahn trains S3, S4, S5, and S6 reach the Messe S-Bahn station in 4 minutes. As the direction of travel changes at the Hauptbahnhof, it is usually necessary to change platforms too – escalators and elevators are available. For some shows, express buses run directly from the airport to the Messe fairgrounds. Note that these buses are not covered by the regular public transportation tickets. Passengers arriving at Frankfurt-Hahn Airport, which is popular with Ryanair and other low-cost airlines, should use the Bohr bus service to the Hauptbahnhof. Total traveling time from Frankfurt-Hahn Airport to the Messe is around two hours. The admission ticket for many shows staged at the Frankfurt Messe often includes free public transportation on the entire Rhein-Main Verkehrsverbund (RMV) public transportation system. This is very convenient for visitors staying in hotels as far afield as for example Mainz or Wiesbaden. Free public transportation is not available to all trade fairs at the Frankfurt Messe. If free transportation is included, it will be mentioned explicitly on the admission ticket – look for the RMV emblem. Complimentary tickets are usually excluded as are most tickets that are not dated or personalized. If tickets are bought at the fair itself it only gives free return transportation. The same goes for vouchers that are only exchanged at the fairgrounds for actual tickets. Public transportation to the Frankfurter Messegelände from most of Frankfurt (fare code zone 50) is €2.80, while travel from Frankfurt International Airport requires a zone 5090 ticket, which is €4.65. Day tickets are usually cheaper than three single fares while day group tickets for up to five give excellent savings too.